The Dragonfly is an American, two-seat, strut-braced, high wing, motorized glider developed from the Bowlus BA-100 Baby Albatross glider which was also designed by William Hawley Bowlus. If you look at the two aircraft you will see the similarities. The obvious external difference between the two is the addition of the pusher engine and the two outboard vertical fins on the tail of the Dragonfly. In addition, the cockpit was significantly widened and side-by-side seating along with two sets of flight controls was added. A retractable tricycle landing gear and a steerable nose wheel operated through the rudder pedals and a hinged canopy completed the major changes to the earlier Baby Albatross to make the Dragonfly. Gliding and soaring gained popularity in the United States from the early 1930s through the postwar years, but the difficulties of getting the glider airborne was a perceived problem. The solution was to motorize the glider and allow the pilot to self-launch. A total of seven Dragonfly aircraft were sold. 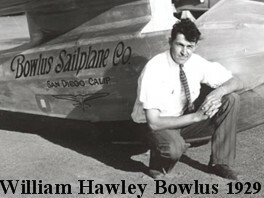 William Hawley Bowlus (May 8, 1896 – August 27, 1967) was a designer, engineer, and builder of aircraft (especially gliders) and recreation vehicles in the 1930s and the 40s. Today he is most widely known for his key role in the design of Airstream travel trailers, which followed his prior famed work as the Superintendent of Construction on Charles Lindberg’s aircraft, the Spirit of St. Louis. Bowlus was an expert at soaring flight and building gliders, established numerous records, trained many of America’s earliest glider pilots, and gave gliding lessons to both Charles and Anne Lindberg. In 1930 he and Lindberg glided at various locations in California. Most notably Point Loma in San Diego where Bowlus conducted many of his flights and tests. Charles Lindberg established a regional distance record for gliders by flying in a Bowlus sailplane from Mount Soledad in La Jolla to Del Mar, making use of the lift at Torrey Pines Gliderport. Anne Morrow Lindberg also flew in a Bowlus sailplane from Mount Soledad and became the first woman in the United States to receive her “first class” glider license (Maxine Dunlap had preceded her in becoming the first woman in the United States to receive a glider license of any kind a “third class” glider license). Bowlus was also the first American to break Orville Wright’s 1911 soaring duration record in an American designed and built sailplane.